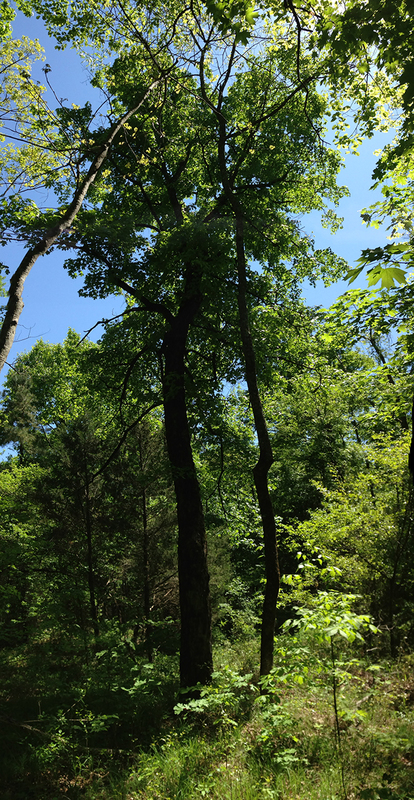 Trees – do we every really capture their vertical awesomeness in a forest? It can be a lot to take in. With improved technology and practice on my part, I’ve started capturing some images that tickle me. Hope you enjoy. Old Maids is a place I sampled >12 years ago. It has some amazing black oak (Quercus velutina). Here is one that shoots to the sky. White Oak. Old Maids Woods, NY. May 2015. I had forgotten about some of the impressive white oak. Paired Oak. Old Maids Woods, May 2015. This was the vertical pan that tickled me. Eastern Hemlock. Old Maids Woods, May 2015. The hemlock are amazing. Hemlock woolly adelgid is there. Visit these hemlock before they are gone. Pitch Pine. Old Maids Woods, May 2015. Holding its own in an odd spot. Boy, Black Oak. Old Maids Woods, May 2015. The black oak are stout. Shortleaf Pine. Talimena Scenic Drive. Oklahoma, April 2015. Not tall, but has potential age (>200 years). Stunted Oak. Talimena Scenic Drive. Oklahoma, April 2015. A highlight along the drive were the stunted oak. Dead Red Oak. Talimena Scenic Drive. Oklahoma, April 2015. An interesting facet of the visit was that it seemed red oak on talus were dying at higher rates than red oak on better soils in the same stand. Sugar Maple. Cucumber Creek Preserve, OK, April 2015. One of the many joys of my work are the surprises. This is a lovely sugar maple in eastern Oklahoma! Glowing Sugar Maple. Harvard Forest, October 2014. The maple in front of my workplace brings daily joy. Frosted Maple. Harvard Forest, Nov 2014. Sinuous White Oak. Boen Gulf, Arkansas, April 2015. Sycamore. Mark Twain National Forest, MO, April 2015. 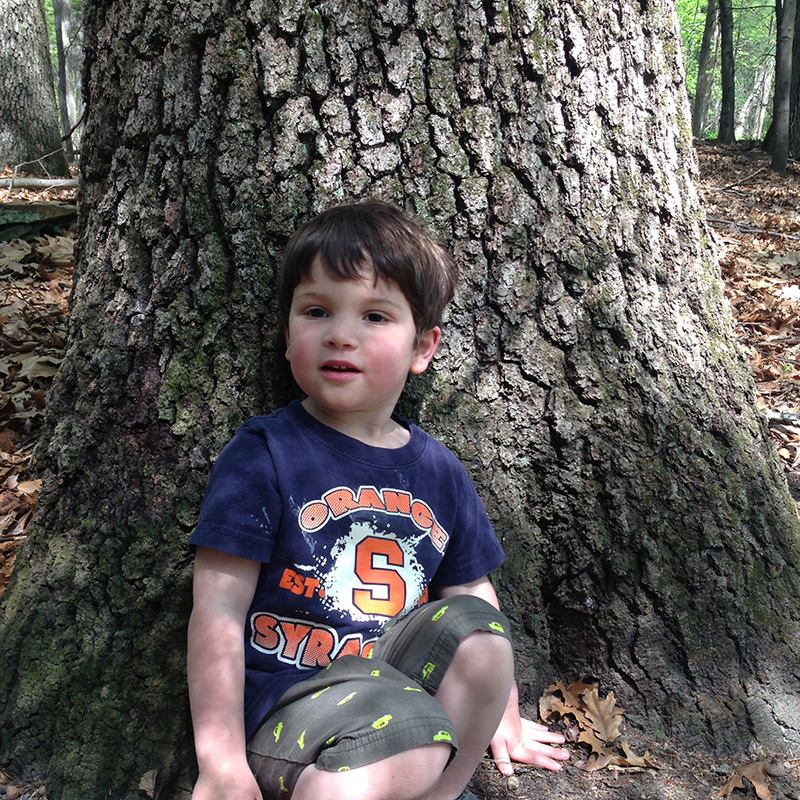 We were searching for sugar maple and ended up wandering into this floodplain forest. The tree heights and volumes made us pause, especially in good light and a blue sky. 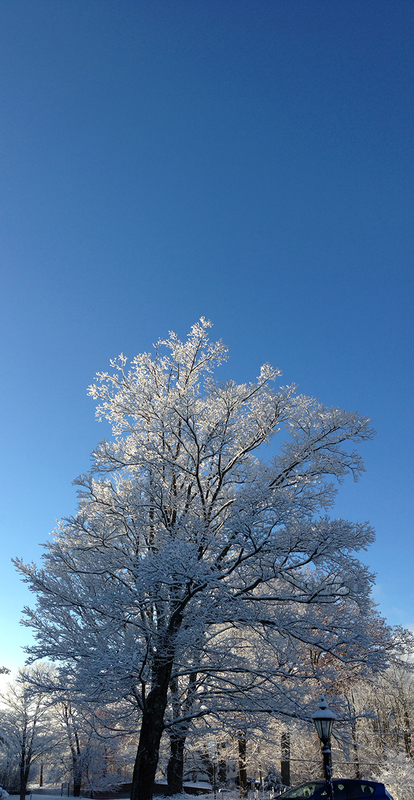 Towering Silver Maple. 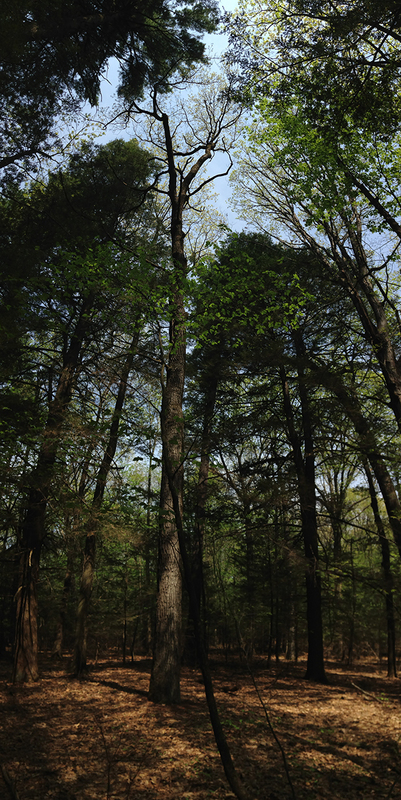 Mark Twain National Forest, MO, April 2015. These are the largest silver maple I’ve seen to date. Supper Club Post Oak. 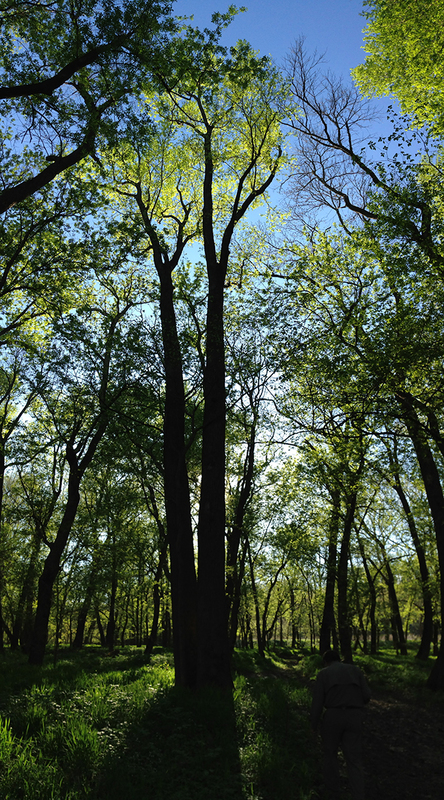 Peter Eck Conservation Area, MO, April 2015. The post oak on top of this plateau, like this one, were some of the most ‘tree-like’ post oak I’ve seen. Often runt’ish, post oak are commonly found on poor to no soils. 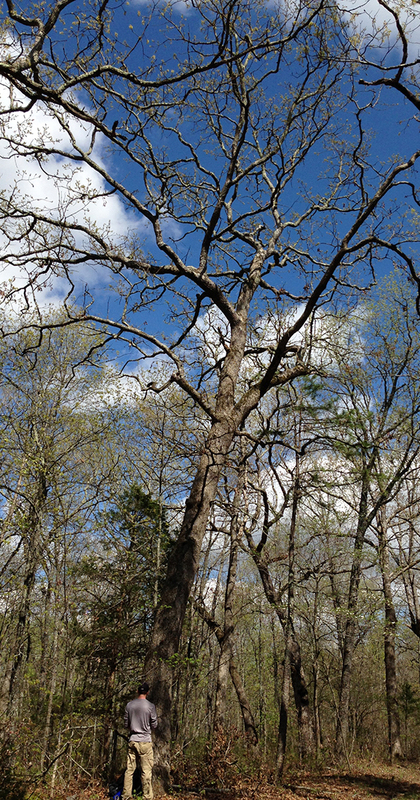 These post oaks were competing with white oak, black walnut, red oak, and looked like normal forest trees – an oddity for the species. Shag. Fulton, NY, May 2015. I’ve seen some monster shagbark hickory. But like post oak, individuals of this species are not always that impressive. What they lack in size (which can be overdone in the tree world) is _always_ made up for in texture and character. Flattop Eastern White Pine. Saco Heath, ME, May 2015. Speaking of runt’ish and overdone, flattop – the flattening of the top of a conifer – can be a sign of age, though not always. It is often associated with a narrow taper of a trees stem, though not always. I had to snap the profiles of these two flattop white pine in Maine. In the world of trees, they are toothpicks. Yet, flattop they be. Their ages are yet to be discovered (or not). Black, Red, Yellow. * Harvard Forest, Nov 2014. Love the contrast in color around the profile of this silhouetted red oak. Oklahoma Morning Tengri. Talimena Scenic Drive, OK, May 2015. Night Tengri. Licking, MO, May 2015.